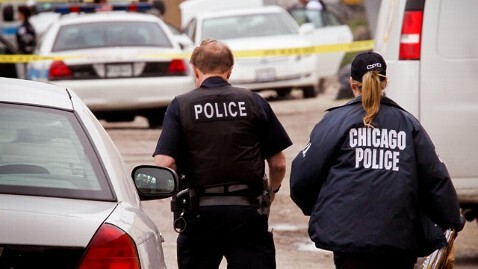 Eleven people died and 43 others were shot over the Memorial Day weekend in Chicago. And through Sunday, homicides in the city increased almost 50 percent over the same period as last year. Those gruesome numbers prompted Mayor Rahm Emanuel and Police Superintendent Garry McCarthy to outline a strategy today to reduce violence in the nation's third largest city. The plan features enhanced technology designed to provide better real-time intelligence about gang activity, more efforts to rid communities of what the mayor called the "cancer" of liquor stores where much of the violence occurs, and taking away the guns that are the instruments of that violence. "We are going to get the job done by intercepting the firearms, intervening in the gangs and taking down the narcotics markets and holding onto them," McCarthy said at a news conference today. Though innocent bystanders were among those shot over the weekend, including a 7-year-old girl, the mayor stressed that "retaliatory" attacks were at the center of much of the violence, noting that "70 to 80 percent of the increase in shootings and homicides are gang-on-gang violence." McCarthy added, "It's not just about solving this crime, it's about preventing the next one." The superintendent cited a new "gang audit and mapping" system to be employed by police that will provide real time information to officers on the street "so the second something happens, whether it's a fight in a school or a shooting on the street, we have the ability to predict where the retaliation will take place." He also said that monitoring social media would be an important component of the strategy because the "gangs go back and forth on Facebook and Twitter and call each other out." McCarthy said Chicago's crime patterns are complicated. "It's a different dynamic depending on the neighborhood. On the West side, much of it is about drugs. On the South side, it's about turf. And on the Latin front, it's about affronts to each other's gangs," he said. Emanuel emphasized new city efforts to shutter or restrict the hours of certain neighborhood liquor stores which he called a "cancer on the community. They are a magnet for gun violence, narcotic dealing and other criminal activity." One city official who presides over an area effected by the upturn in shootings greeted the plan announced today with skepticism. Alderman Carrie Austin told ABC's Chicago affiliate WLS, "We've all heard this before. We've heard it in different ways. Let's see what this spin will do." And while the mayor stressed that ending gang violence must be a community effort as much a police effort, he seemed to acknowledge the difficulty of getting broad involvement with a problem so concentrated in the poorer parts of the city. "You cannot find comfort because it was 'not in my block,'" he said. "It happened in your city and when a child is hit or is a victim of gun violence, that is a tear in the fabric of our city."